Letters to Elijah: It Knows What I Like! I imagine that most of you that read this blog probably already know about this... but for those of you that don't - it's going to blow you away! 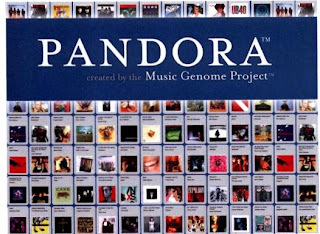 Pandora a is web site that knows what you like. Music that is. Simply put, you create your own personalized radio station by starting with one of your favorite artists. From there Pandora adds songs based on that original artist. ~ If you don't like the song it picks - you don't have to listen to - skip to the next one. ~ By simply giving Pandora a thumbs up or thumbs down to any song it learns what you like - this makes your personalized radio station that much better! ~ You can have mulitiple radio stations. Some days you feel like jazz, other days you want country. ~ The site is free! no membership, no fees, no pop-up ads or spam emails! Give it a try.. better yet, leave me a comment with your personalized stations.